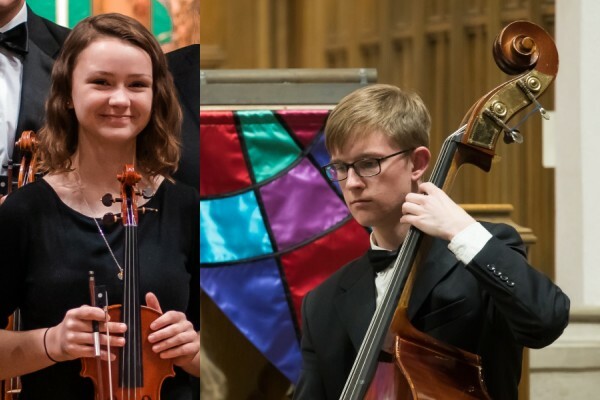 Enjoy the beautiful playing of the Camerata Chicago Academy Orchestra comprising excellent young musicians who will perform Handel’s Water Music. Cameron Fuller will perform the Capuzzi Double Bass Concerto with the Academy Orchestra. They are joined by the Junior Academy, a second, smaller ensemble of students aged 8 – 14, who will play the Vivaldi Violin Concerto Opus 7 No. 11 with young Academy soloist Tabitha Rea. 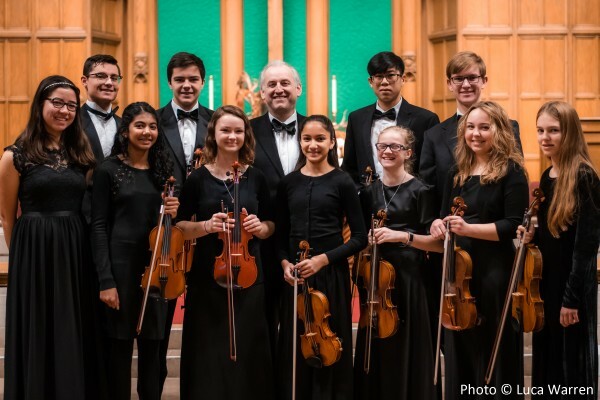 The Academy Orchestra (the ‘senior academy’) is proud to play with Concert Master Amelia Piscitelli, the 17 year old violin virtuoso, who has recorded the Vivaldi Four Seasons Educational Project with the Camerata Chicago professional orchestra. The CD recording will be released world wide and will be available in many schools in the Wheaton and West Chicago area. Saturday’s concert is extremely child friendly, is approximately 1 hour long or so, and there is a cookie reception following the performance during which you can meet and mingle with the artists. It is always a lot of fun. Watch the videos to see how excellent these musicians are – you will be amazed! See the Academy play the Vivaldi Concerto for Four Violins and the Bach Double Violin Concerto; watch the Junior Academy perform the Hornpipe from Handel’s Water Music and a Bach Minuet. – with double bass soloist Cameron Fuller, who graduates this year. – 15 numbers including the famous Air and Hornpipe. – with Tabitha Rea accompanied by the Junior Academy Ensemble. The Camerata Chicago Academy was founded in 2014 and there are two orchestras comprising advanced students. The Academy Orchestra: Advanced high-school students play as a string orchestra. 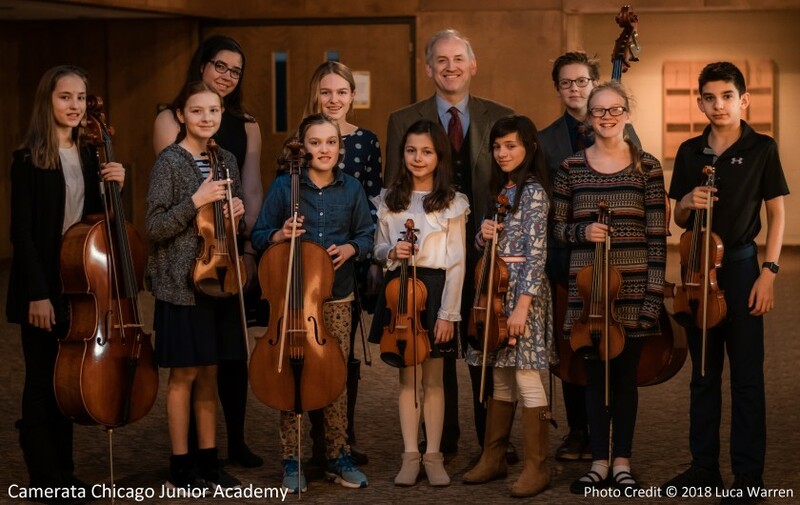 The Junior Academy: Students aged 8 – 12 playing as a small chamber ensemble. Camerata Chicago Academy provides a marvelous opportunity for young musicians to perform in a professional atmosphere under the direction of an internationally known conductor, Drostan Hall, Camerata Chicago’s Music Director, who has 25 years of experience of training aspiring young musicians. The objective of the Academy orchestra is to achieve a very high level of music making to produce a disciplined and professional sound, allowing young musicians to learn to work together. For ten years Maestro Hall conducted the Baroque Festival Orchestra, an accomplished training orchestra for students. Known for its high level, the orchestra garnered two invitations to perform on the WFMT radio show Introductions. The Academy orchestra is very similar in size and scope to the BFO (see photo below). I invite you to listen to this live broadcast from WFMT’s Introductions of the BFO performing Frolicksome Finale from Benjamin Britten’s Simple Symphony. This broadcast illustrates the experience you will receive in the Camerata Chicago Academy. Start Date: September 2018 and Saturdays in the Fall and Spring Semesters. Concert Details: The Academy works towards high quality performances each Fall and Spring. See these concerts on our ticket system. Tickets are only $15. Repertoire: Featured repertoire includes music from the Baroque and classical periods and the string orchestra literature. On occasion, sectional rehearsals will be coached by a member of Camerata Chicago. Additionally, solo opportunities will be given to the most outstanding members of the ensemble and outside guest artists may be invited to solo with the orchestra. To audition for the Academy, please contact us here, or call 630-221-5555.